During the past several decades, significant technical and methodological progress has been made in liquid and solid state NMR, opening new fields of applications, including the study of the structure and dynamics of membrane proteins. We are developing new strategies for the determination of the structure, orientation, dynamics and/or interactions of membrane components (e.g., sterols, lipids, proteins and peptides). G Protein Coupled Receptors (GPCRs) are the largest superfamily of membrane proteins in the human genome and play a key role in human physiology by initiating signal transduction in response to extracellular stimuli. The Cholesterol - beta2 adrenergic receptor interactions have been explored by HRMAS NMR in Lipid Cubic Phases. (Biophys J 2014, in coll. with D. Gater, Dubai and V. Cherezov, La Jolla, USA). The opioid receptors are activated by various analgesics, endogenous endorphins and drugs of abuse such as heroin and opium. The kappa opioid receptor (KOR) and its cognate peptide dynorphin (Dyn) are implicated in neuronal pathway associated with addiction, pain, reward, mood, cognition and perception. KOR antagonist-bound, inactive structure has been solved in 2012 by X-Ray crystallography by the Stevens’s group (Nature, 2012) and more recently, the structure and dynamics of KOR- bound Dyn was determined by NMR (PNAS USA, 2015). However, a great deal of structural and functional data is still needed to elucidate the structure- function relationship of GPCRs and the mechanisms that drive their activation. (C. O’Connor et al., PNAS, 112, 11852-11857 (2015)). The structure of kpOmpA has been solved in DHPC detergent micelles by liquid state NMR (J. Mol. Biol. 2009). After reconstitution in lipid bilayers, its dynamics was assessed by 15N relaxation measurements using proton detection-based approach at very fast MAS solid state NMR (O. Saurel et al., JACS, 2017, in collaboration with G. Pintacuda - ISA-CRMN, Lyon), and its reversible unfolding was shown by AFM-SMFS (in collaboration with D. Müller - ETH Basel, Structure 2012). Application and development of "cellular solid-state NMR spectroscopy" on Corynebacteriales: Porins from C. glutamicum are studied directly in the bacterial cell envelope using a combination dedicated isotope labelling schemes, sample preparation routes and state-of-the-art multidimensional solid-state NMR experiments under MAS conditions and at high magnetic field (M. Renault et al. (2012), PNAS (13), 4867; Angew. Chem. Int. Ed. 51,1-5). 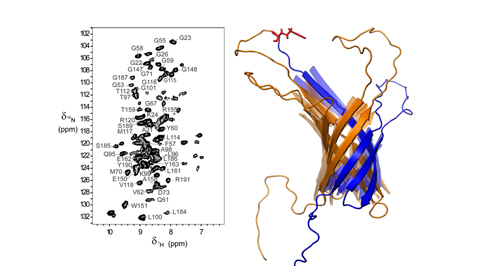 Cellular ssNMR spectroscopy on Corynebacteriales: ssNMR spectra of (U-13C,15N)-labelled cell envelope from C. glutamicum ATCC13032 (black) showing characteristic 13C-13C correlations from highly flexible arabinogalactan and peptidoglycan moieties (left) and 15N-13C correlations from endogenous cell-wall associated membrane proteins (right). NMR spectra of equivalent quality from those obtained of E. colicell envelope (red) can be obtained. Biochemistry: Expression, purification, refolding, and membrane reconstitution of membrane proteins. Biophysics: Circular dichroism, fluorescence, microcalorimetry. Solid state NMR: 500 MHz Bruker Avance II spectrometer; various static probes, and MAS 4 mm and HR-MAS double HX probes. 700 MHz Bruker Avance III spectrometer; quadruple resonance HCPN and PISEMA static probes, MAS 3.2 mm HCN, 3.2 Efree HCN and 1.3 mm triple HCN and HR MAS 4 mm double HX probes. Simulations and molecular dynamics: Computing cluster 250 cpu, AMBER, GROMOS and in-house software (GOSA, ANAGRAM). -*Rath, P., Saurel, O., Czaplicki, G., Tropis, M., Daffe, M., Ghazi, A., Demange, P. et Milon, A. Cord factor (trehalose 6,6’-dimycolate) forms fully stable and non-permeable lipid bilayers required for a functional outer membrane, BBA - Biomembranes 1828, 2173-2181 (2013). Iordanov, I., Renault, M., Reat, V., Bosshart, P. D., Engel, A., Saurel, O., and Milon, A., Dynamics of Klebsiella pneumoniae OmpA transmembrane domain: The four extracellular loops display restricted motion behavior in micelles and in lipid bilayers, Biochim. Biophys. Acta , 1818, 2344-2353, (2012). Bosshart, P. D., Iordanov, I., Garzon-Coral, C., Demange, P., Engel, A., Milon, A., and Muller, D. J., The transmembrane protein KpOmpA anchoring the outer membrane of Klebsiella pneumoniae unfolds and refolds in response to tensile load, Structure 20, 121-127, (2012). Rath, P., Demange, P., Saurel, O., Tropis, M., Daffe, M., Dotsch, V., Ghazi, A., Bernhard, F., and Milon, A., Functional expression of the PorAH channel from Corynebacterium glutamicum in cell-free expression systems: implications for the role of the naturally occurring mycolic acid modification, J Biol Chem 286, 32525-32532, (2011). Holt A., Rougier L., Reat V., Jolibois F., Saurel O., Czaplicki J., Killian J.A. and Milon A. Order parameters of a transmembrane helix in a fluid bilayer: case study of a WALP peptide. Biophys. J.2010, 98, 1864-1872. Renault M., Saurel O., Czaplicki J., Demange P., Gervais V., Lohr F., Reat V., Piotto M. and Milon A. 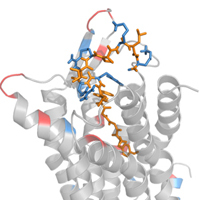 Solution State NMR Structure and Dynamics of KpOmpA, a 210 Residue Transmembrane Domain Possessing a High Potential for Immunological Applications. J. Mol. Biol. 2009, 385, 1, 117-130. Soubias O., Jolibois F., Milon A. and Réat V. Determination of the orientation and dynamics of ergosterol in model membranes using uniform 13C labeling and dynamically averaged 13C CSA as experimental restraints. Biophys. J. 2005, 89, 1120-1131.